When a client is stuck blaming other people, it can be delicate work to help them see the situation through a different lens. Normalizing the urge to blame might be the key to lowering defenses and making a step in the right direction. 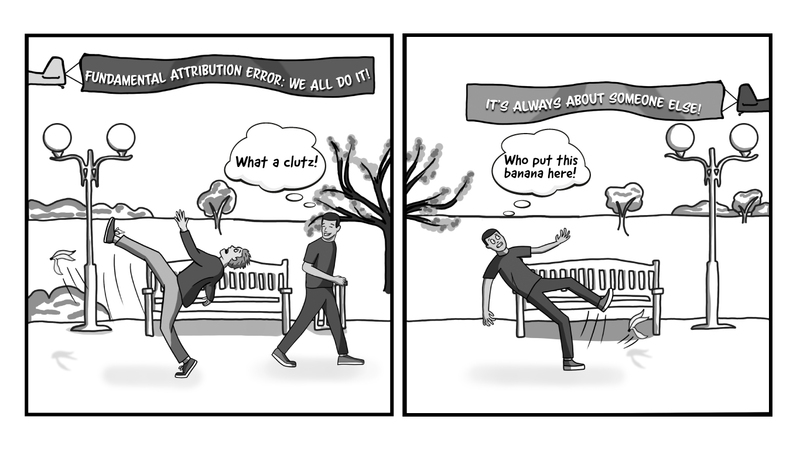 So we created this cartoon that you can use with your client to help them see how we’re all predisposed to blame others when things go wrong. 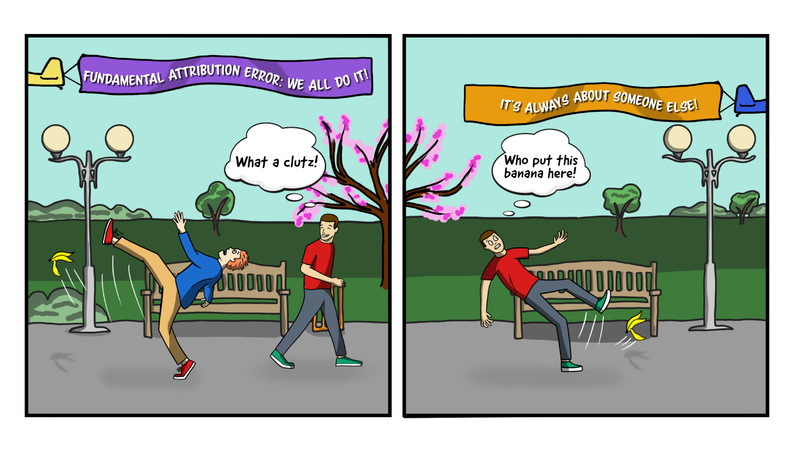 It explains fundamental attribution error – a concept I’m sure you know, but one that might be new to many of your clients. Perhaps it can be just the right message to begin to free your client from the weight of blame. Let’s look at the man in the red shirt. When he sees someone else slip on a banana peel, his first thought is that there is something wrong with that person. It’s that guy’s own clumsiness that caused his fall. Later, when he himself slips on a banana peel, his first though is that someone else must be responsible. This is known as an attribution error: we tend to think that another person’s behavior reveals who they are, while our own blunders are someone else’s fault (or, to put it nicely, due to external factors). Here’s a tool you can use to help clients look at their reactions when under stress. Adapted from a strategy that Ellyn Bader, PhD shared. Dr. Kristin Neff takes on the vulnerability that lies beneath a client’s resistance. 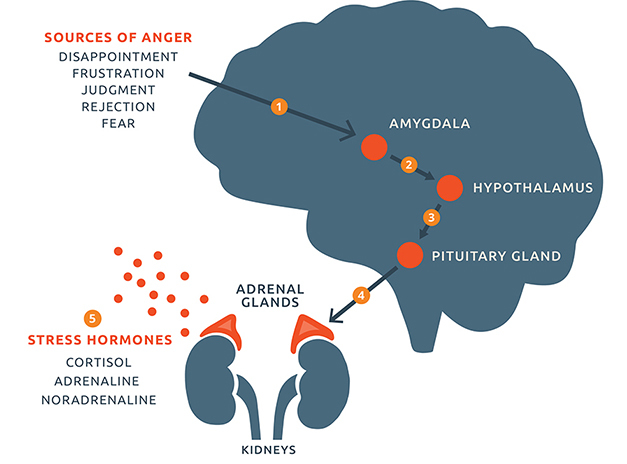 Here’s a tool you can use to help clients understand the impact of anger on the brain and body. Bessel van der Kolk gives us his perspective as a trauma specialist on how to live with uncertainty. Sonja Lyubomirsky details research highlighting current investigations into how to shift negative emotions. Elisha Goldstein walks through a metaphor he uses with clients to help them settle into a greater state of equilibrium and gain greater perspective. Sonja Lyubomirsky PhD, a professor of Psychology at UC Riverside, discusses some of the latest research studies that she’s involved in. She details Innovative studies on Embodiment research, the brain science of happiness and research on targets of gratitude. 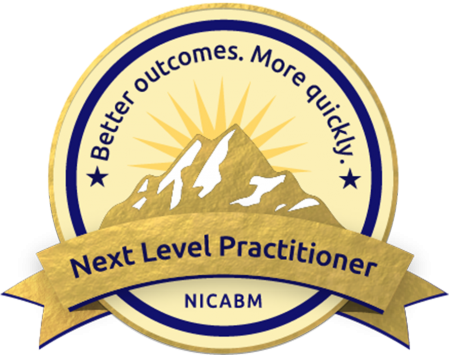 Zindel Segal, PhD details the value of including mindfulness within the framework of psychotherapy to help clients develop adaptive skills and self-regulation. Dr. Laurel Parnell offers effective brain-savvy techniques for helping clients get “unstuck” from their shame. Laurel shares practical EMDR and mindfulness practices to help rewire a client’s shame and build new neural connections. Donna gives an energy approach to helping clients foster resilience. Belleruth Naperstak, LISW shares a story about how she worked with a client whose self-defeating beliefs kept her from seeing her true potential. Elisha Goldstein, PhD gives you two ways to help your clients connect to their vitality over the long haul. 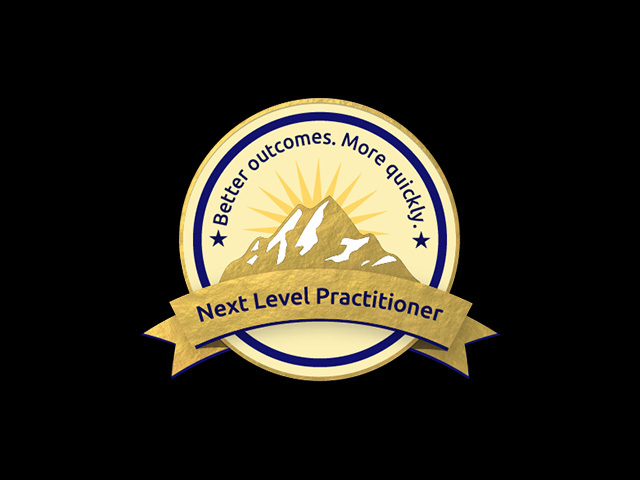 Marsha Linehan, PhD, ABPP explains a case she miss-assessed, as well as how to find out what the client really needs to work on so that you can avoid costly assessment errors. 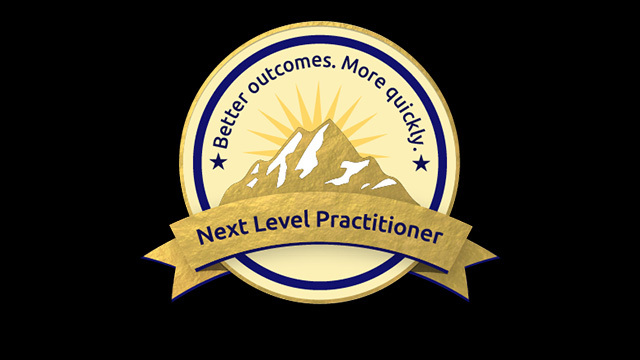 Donna Eden gives you a short, simple energy exercise that any practitioner can use to help their clients. Michael Yapko, PhD shares one skill to help clients tolerate the unknown. Plus see how Michael used it in his own work. Find out the three ingredients essential for breaking people out of complacency so they can keep moving forward. Scott Miller, PhD gives us a framework for understanding the kind of thinking that can prevent people from reaching their full potential. Seven experts share the insights, case studies, and exercises that can help people break free of what's holding them back. What restores aliveness and vitality? Get four expert perspectives on how to help patients reignite the spark of life. Why do people get stuck? And how can we help them change? Discover four ways to reframe the way you look at and think about stuckness.